Kenneth Olden, Ph.D., Sc.D., L.H.D., is the founding and acting dean of the School of Health Professions at Hunter College, part of the City University of New York. 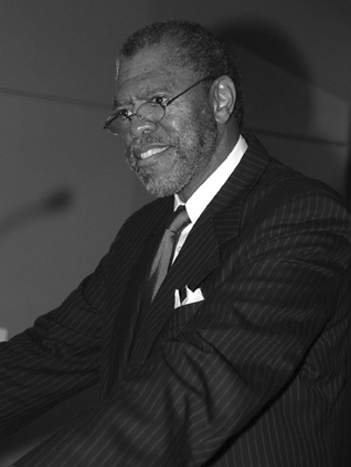 He assumed that position in 2008, after serving as director of the National Institute of Environmental Health Sciences and the National Toxicology Program since 1991––the first African American ever to head an institute of the National Institutes of Health (NIH). Previously Dr. Olden was a professor and chairman of the Department of Oncology and director of the National Cancer Institute (NCI)-supported Comprehensive Cancer at Howard University in Washington, D.C.
Dr. Olden is a highly regarded cancer researcher whose distinguished career has included appointments at Harvard University Medical School in Boston, MA, and the NCI in Bethesda, MD. He has published more than 170 articles and book chapters dealing with cancer biology and environmental health research and policy, including two of the 100 most-cited papers in the life sciences for 1978-79. Dr. Olden has served on numerous national and international committees and has been a major invited speaker and symposium organizer. He has received four of the most prestigious awards in public health: the Calver Award in 2002, the Sedgwick Memorial Medal and the Laurenberg Award in 2004, and the Julius B. Richmond Award in 2005. He has also received three of the highest awards for a public servant in the executive branch of the U.S. Government: the Secretary’s Distinguished Service Award in 1995, the President’s Meritorious Executive Rank Award in 1997, and the President’s Rank Award in 1998. He is the recipient of five honorary degrees and a prestigious international award, the Princess Takamatsu Cancer Medal, from the Japanese Royal Family. Dr. Olden was elected to membership in the Institute of Medicine (now the National Academy of Medicine) in 1994.